Today marks the centenary of the start of the Third Battle of Ypres, popularly known as Passchendaele, after the final two phases of the offensive which lead to the capture of Passchendaele Ridge and the village in November 1917. 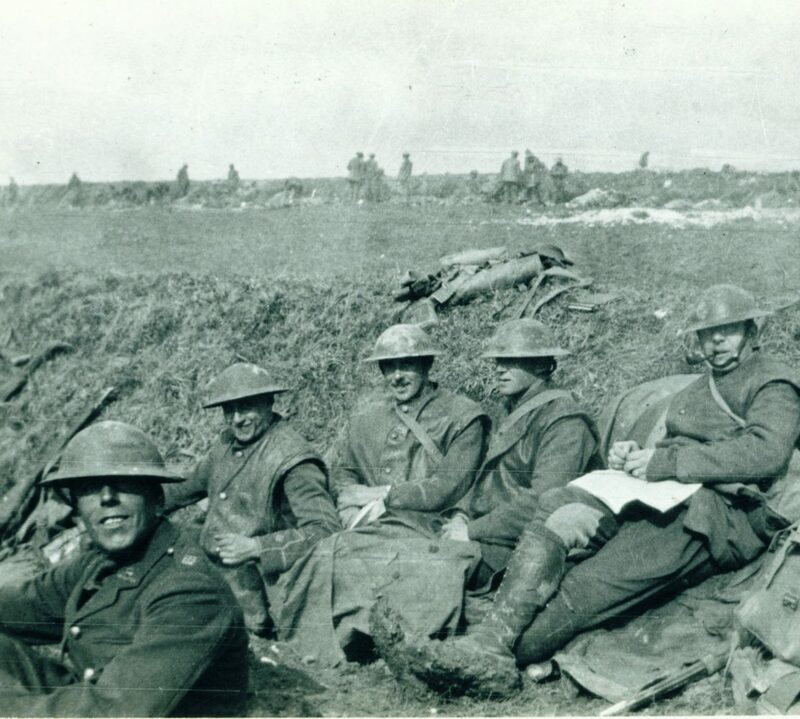 The first phase of the battle, which took place on this day in 1917, was the Battle of Pilckem Ridge which saw an attack at 3.50am, dawn a hundred years ago, from Boesinghe in the north to the Bellewaarde Ridge and down to the Menin Road at Hooge. British units in these areas were part of Gough’s Fifth Army and took the majority of their objectives. However, there were substantial losses on this day and it was the bloodiest single day at Ypres in all four years of war with over 6,200 soldiers killed in action. That afternoon it began to rain, and very quickly the summer of 1917 turned into the wettest in living memory. Shells smashed the landscape, and along with it all the drainage, and the water collected in trenches, dugouts, shell-holes and turned the mud into liquid mud in many place: men, mules and horses, guns and tanks, all disappeared. A soldier of the Artists Rifles later recalled the battlefield conditions by October 1917. Dawn reveals to us a sight which nobody could visualize without having actually seen it. We can stand up and see the round of the horizon. It is like being on the sea, but our sea is a sea of mud. There is not a blade of grass visible nor a spot of color anywhere. But Passchendaele was a battle of contrasts. At one point the weather turned for the better and the ground was so hard that shells bounced off it. Gough’s Fifth Army was relieved by Plumer’s Second Army and in the final phase Passchendaele was taken by British and Canadian troops: the Canadians losing over 16,000 men in ten days fighting, and their battle for the village ending with a snowstorm which brought fighting to a conclusion. Rightly or wrongly, for many, Passchendaele has become one of the iconic symbols of the Great War: for most a symbol of pointless slaughter. The images from that battle have arguably defined our perception of the First World War. Today thousands will gather at Ypres and stand in Tyne Cot Cemetery to remember one of the most terrible battles of a long and bloody war. Whether we see victory in the mud of Flanders will remain the hot topic of historians for generations, but for most they are happy to remember, and see Flanders returned to the farmland it once was. Their connection to Passchendaele will be a personal one, and it is this connection that draws so many to the subject of the Great War. On this day a century ago one of the forgotten battles of the Great War was fought in the sand dunes around the Belgian town of Nieuport (now Nieuwpoort) Nieuport was the end, or the beginning, of the Western Front depending on how you looked at it, and it was here the trench system flowed onto the beach, and at night the moon glinted across the water and on the barbed wire in the sea. Since 1914 this area had been a quiet sector held by the Belgian Army. The front line positions around the town were east of the Yser Canal by 1917, and at this time British troops moved up here to initially take part in a seaborne operation along the Belgian coast. Despite extensive training for this, the 1st Division found themselves just holding the line in an unremarkable, and quiet, sector. That was until 10th July 1917. At 6am that day the German guns began to drop shells in some intensity along the whole front and by 1pm every calibre from 5.9-inch to 11-inch was falling on the British lines. It grew in intensity until 6pm when there was a short lull and at 7.15pm the Germans attacked. The assault waves were made up of German Marines. The scale of the bombardment and the ferocity of the assault caught the British by surprise and 2nd Battalion King’s Royal Rifle Corps and 1st Battalion Northamptonshire were almost destroyed in the fighting that followed. In most cases the men in the forward areas were surrounded. The bridges behind them, which crossed the Yser, were smashed in the bombardment, and men only escaped if they could swim. If not, they became prisoners of war. The support battalions of 2nd Battalion Royal Sussex Regiment and 1st Battalion Loyal North Lancs were also badly affected and suffered heavy casualties. It is believed only 70 men and four officers made it back from the KRRC and Northants. The dead from the action are now buried in Ramscapelle Road Cemetery, the northernmost British cemetery on the Western Front. The missing are commemorated on the Nieuport Memorial, damaged during the Dunkirk operations in 1940 but still guarded by Charles Sergeant Jagger‘s impressive Lions. A century ago today was the last major attack at Arras on a wide front from Fresnoy in the north in the Canadian sector to Bullecourt in the south, where the Australian troops attacked the Hindenburg Line beyond the village. In some areas, there was some limited success, in most areas total failure. The bodies of the dead lay in No Man’s Land, cut down as they had tried to advance. Few were recoverable, and most were eventually buried by shell fire. The battlefield at Arras on this day was truly grim, and truly a slaughterhouse for so many units that went into action. Casualties on 3rd May 1917 were the heaviest of the whole battle with over 6,000 officers and men killed in action; of these nearly 5,000 of them are commemorated on the Arras Memorial to the Missing. It must be one of the highest proportion of missing for a single battle in any British engagement on the Western Front. Jack Harrison VC (right) on the Somme in 1916. Among the many stories from 3rd May 1917 is that of the men from the Hull Pals battalions of the East Yorkshire Regiment. On this day they made an attack on Oppy Wood and suffered terrible casualties. Jack Harrison, a local Hull teacher and rugby player, was awarded the Victoria Cross posthumously that day. For most conspicuous bravery and self-sacrifice in an attack. Owing to darkness and to smoke from the enemy barrage, and from our own, and to the fact that our objective was in a dark wood, it was impossible to see when our barrage had lifted off the enemy front line. Nevertheless, 2nd Lt. Harrison led his company against the enemy trench under heavy rifle and machine-gun fire, but was repulsed. Reorganising his command as best he could in No Man’s Land, he again attacked in darkness under terrific fire, but with no success. Then, turning round, this gallant officer single-handed made a dash at the machine-gun, hoping to knock out the gun and so save the lives of many of his company. His self-sacrifice and absolute disregard of danger was an inspiring example to all. (he is reported missing, believed killed. Like so many of the men who fell on 3rd May 1917, Jack Harrison has no known grave and is commemorated on the Arras Memorial. Today is the centenary of the Battle of Arras. Much of the news today will be dominated by Vimy Ridge, but it is worth remembering this was one of many battles on the Western Front in which many from many Commonwealth Nations fought side by side with their comrades in the British Army. The Battle of Arras began in a snowstorm on 9th April 1917, when Australian, British, and Canadian Divisions fought on a wide front from Vimy Ridge in the north (Canadian sector), to the trenches east of Arras (British sector), to Bullecourt in the south (Australian sector). It was hoped that the much-awaited breakthrough might be made here, and as always the Cavalry were kept on hand – and indeed used during the battle..
Today we remember all those who fought and fell at Arras a hundred years ago. A century ago in March 1917, the Germans began to pull back from the Somme front into new, pre-prepared defences which they had been constructing during the harsh winter of 1916/17. These positions were known to them as the Siegfriedstellung but to the British as the Hindenburg Line. A massive system of trenches stretching from near Arras past Cambrai and St Quentin, and indeed beyond towards Soissons. The withdrawal away from the Somme was called Operation Alberich and saw the Germans gradually pull back from forward positions and leave in their wake an area of damaged and smashed ground; with major buildings destroyed and trees cut down and mines blown at major road junctions to impede traffic. In some areas, delayed action mines were planted as booby traps, most notably at Bapaume where a mine went off after the Australian occupation of the town in March 1917, resulting in substantial casualties. As the Germans pulled back, British and Commonwealth troops followed in hot pursuit and there were a number of engagements in what was essentially open warfare in some of the villages between the Somme and the new Hindenburg Line positions. By late March into early April 1917, the Germans were now properly in their Hindenburg Line positions. The British were beginning to dig in opposite and a new front line was gradually being established. At the same time plans for a new British offensive was being formulated which would become the Battle of Arras, which began on 9th April 1917. As the coldest winter of the war was coming to an end on the Somme front, when temperatures had dropped to more than -20, the British Army fought its last battle in this sector before the Germans withdrew to the Hindenburg Line and the fighting moved to other areas. In many ways, a forgotten action of WW1, the Battle of Boom Ravine on 17th February 1917 saw two divisions attack the German positions on the Ancre Heights close to the village of Courcelette and a third north of the Ancre Valley. Boom Ravine was the name the British gave to a long Y-shaped ravine that snaked its way from near the village of Grandcourt towards the high ground close to Courcelette. There had been two major trench lines protecting it – Regina Trench and Desire Trench – both captured by Canadian troops in 1916 during the Battle of the Somme. The capture of Desire Trench on 18th November 1916 had ended in a snowstorm and brought fighting here to a close. Both sides had settled down to winter quarters but as that winter moved towards a close, the British went on the offensive again at Boom Ravine. Regina Trench Cemetery: many of the dead from Boom Ravine lie here. On the morning of 17th February 1917, two divisions attacked with the 18th (Eastern) Division, veterans of the Somme since 1915, on the left and 2nd Division on the right; north of the Ancre the 63rd (Royal Naval) Division also attacked. It was cold and there was snow on the ground, and the attack by 2nd Division ran into problems and was repulsed with not inconsiderable losses. The attack by the Somme veterans of the 18th (Eastern) was more successful, the men getting into Boom Ravine and clearing some of its deep dugouts. At the cost of over 2,200 casualties the Germans had been pushed back in two of the three attack areas – the Royal Naval Division being successful near Baillescourt Farm – and if the German high command needed any more convincing these winter operations on the Somme proved that the German Army’s position on the Somme front was untenable and would have to be abandoned for the Hindenburg Line. The battle was unusual in a number of ways as it saw the first widespread use of the new 106 ‘Graze’ Fuse, which on shrapnel shells more effectively cut the German barbed wire. It also saw British troops desert on the eve and give up the plan to the enemy, who was thus prepared for the assault; that in itself was not unheard of, but the fact that it was recorded in several accounts later published was. How significant this was for the outcome of the battle is open to debate. If you want to read more about the Battle of Boom Ravine, the late Trevor Pidgeon’s Battleground Europe: Boom Ravine by Pen and Sword is worth a look. Part of an excellent series of books covering recipients of the Victoria Cross (with previously volumes on 1914-1916), this new publication is decided into two main sections. The first takes a chronological approach and examines the first VC action of 1917 and ends with the final award prior to the Third Battle of Ypres; presumably another volume will cover that battle and the rest of 1917? The second section contains biographies of the men awarded the VC during this period. Packed with information and obviously the result of a huge amount of research, this is an excellent and highly recommended companion to those award the highest honour from the Somme to Arras and Ypres. There are useful maps, good photographs and handy information on visiting the battlefields. Available on the Pen & Sword website. This is part of a series of reference volumes the author has written regarding the Tyne Cot Memorial and Menin Gate. There is a brief introduction to the Menin Gate and the next 400 or so pages are essentially a long list of names and details of men commemorated on the North side of the Menin Gate. The order is somewhat strange in that it follows the panel numbers of the memorial, and there isn’t any obvious structure to the soldier’s stories except that they follow the names on the panel: which is I suspect how the author anticipates you use the book by standing there and looking down the names, reading their stories in the book. Some of the stories are detailed, others less so and read like a summary. I would have preferred fewer stories but in greater depth, and a few illustrations (there are none! ), but it is clear a huge amount of research has gone into this interesting volume. Available on the Pen & Sword website.